Do you want to eat more fish but you hesitate to give it a shot? Do you tend to feature more seafood on your menus during the summer months when it can be quickly grilled outside? 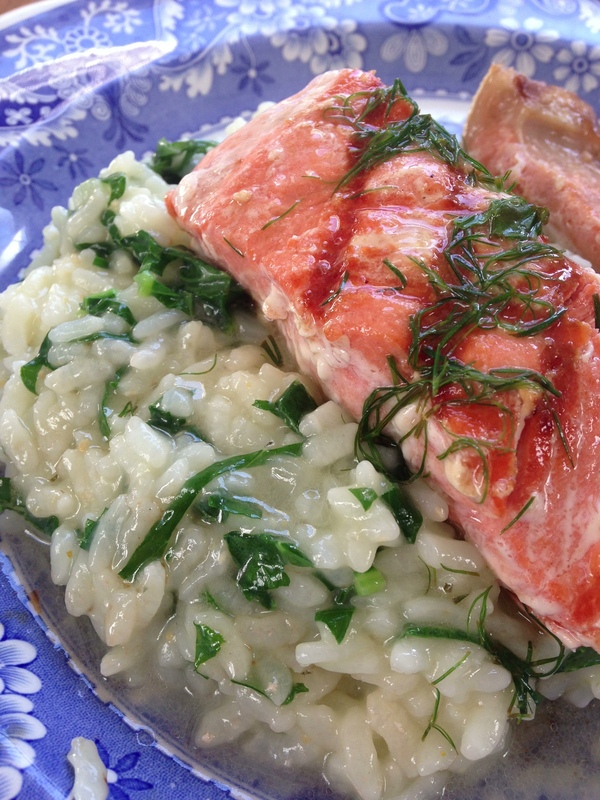 Well, understandably, seafood, salmon in particular, lends itself to warm weather dining. During the summer, salmon is literally landing on our Pacific Northwest shores fresh and practically still flapping…that being said, a hefty chunk of the salmon that hails from Northwest waters is processed and frozen for the off season. Over the years, I’ve cooked a lot of frozen salmon and without a doubt those frozen fillets offer convenience beyond compare. Easily found in the frozen food cases in the seafood department and sold pin boned, portioned and packaged, they can simply be pulled from the freezer on short notice and defrosted in a flash by submerging the package in cool water. One of my favorite ways to cook these convenient fillets is to grill them INDOORS on my Le Creuset ridged grill pan. I inherited my small red ridged pan from my father and it’s a great pan for quick one person seafood dishes. After preheating my grill pan over moderately high heat and simply sprinkling my salmon with a little sea salt and spraying it (and the pan) with oil, I plop my defrosted salmon fillet on the ridges and savor that initial sizzle. I let the fillet, which is probably about 5 to six ounces, sear for about a minute or two. I then flip it and let the other side sizzle and sear. (I sometimes cook it with the skin on and other times I take the skin off prior to cooking.) After about a minute or two on the other side, I cover the fillet, turn down the heat to moderately low and let the fillet cook for another minute, checking for doneness. This super quick grilled salmon is then ready to be served on top of rice, potatoes, grains or even a lightly dressed salad or a medley of sliced tomatoes. 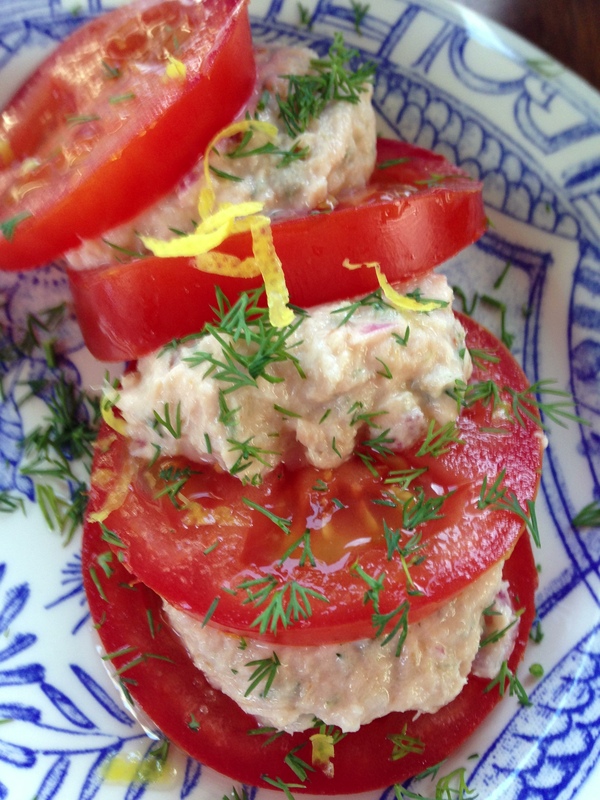 Alternatively, it can be turned into a simple sandwich or even a decadent Salmon BLT. Note: And, if you are Caesar Salad fan, try my recipe for Blackened Sockeye on Kale Caesar Salad, which I developed for the Bristol Bay Sockeye website last spring. For additional information on frozen, check out this section too. Frozen Bristol Bay sockeye. A super healthy and convenient superfood! So, what’s your opinion on frozen seafood? Do you think it is inferior to the fresh seafood that you can purchase from the fish counter? Have you perused the freezer case in the seafood department lately? Do you regularly stock frozen salmon, cod, or other fish for quick weeknight dinners at your house? Admittedly, I am quite picky about my seafood, but over the years I have learned that seafood in the freezer is an amazing asset! To be quite frank, keeping seafood in the freezer saves me time, money and the hassle of heading to the grocery store at the dreaded five o’clock hour. In my household, we regularly keep wild salmon fillets as well as cold and hot smoked salmon in the deep freeze. I often just head to the freezer and pull out a few fillets for dinner. It works for me and it leaves me free to do other things. When defrosted, my previously frozen seafood often looks far better than the seafood kicking around the seafood case. Even though I have salmon in the freezer, I decided to buy a whole sockeye fillet at QFC last night. I’ve been eyeballing these fillets for some time now, so I thought it would be a good idea to do a little consumer research myself. 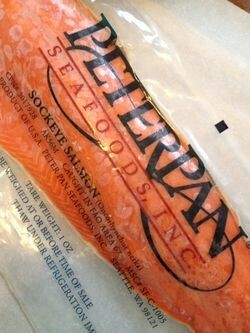 The wild Alaskan sockeye was from Peter Pan Seafoods and was caught in the FAO area 67, which is Bristol Bay. The sale price was $8.99 per pound and the fillet that I chose set me back about $12, which is a good deal. Having toured many of the processing facilities in Bristol Bay, Alaska, I know that many of the sockeye fillets are promptly processed and frozen right after harvest. I know this, because I sported hair nets and stood there watching those freshly caught wild salmon race along the slime lines towards the freezer! This rapid processing, of course, protects many of the inherent characteristics of the salmon and brings a very hiqh-quality product to the market. The processors up in Bristol Bay work quickly because the wild salmon arrive in force over the course of about six weeks. Frozen fish is a fabulous time saver. Often frozen promptly after harvest, frozen fish, particularly salmon, is widely available and is a great time saver for busy cooks. Last night, I decided to simply let my sockeye fillet defrost slowly in the fridge. Today, I have to figure out what to do with it. Weighing in at less than two pounds, there really isn’t an excess of salmon for my family of five. I’m just perplexed on what to do with this amazingly bright red wild salmon. Grill it whole? Cut into chunks and pan sear? Cure it into an affordable yet luxurious gravlax for a weekend dinner party ? So, do you buy the frozen seafood found at your local markets? If so, what do you choose and how do you use it? I have more to say about frozen seafood and will report back on my sockeye fillet, so stay tuned, folks!